Cinema billboard designed by Ming Wong, painted by Neo Chon Teck (2009), variable dimensions, acrylic emulsion on canvas. All images: Courtesy the artist. In this re-writing of their titles, the original movies slide into an uncanny rebirth. Every time images from the movies are reincarnated in our own lives – every time there is a coincidence between the movies and ourselves – a new life comes into being. Through Ming Wong’s process of reenactment, these images, which both preserve and exceed consumption, take on new life. Video still from Life & Death in Venice / Leben und Tod in Venedig / Vita e Morte a Venezia (2010). From its opening scene, Visconti’s Death in Venice manifests a metaphoric landscape: set against the soundtrack of Gustav Mahler’s brooding Adagietto, a lonely boat carries the protagonist, the composer Aschenbach, toward life’s opposite shore. In contrast, Ming Wong’s Life & Death in Venice opens against the backdrop of a common tourist city, with the artist, dressed as Aschenbach, attracting the curious glances of tourists as he passes through St. Mark’s Square. Ming Wong places the protagonists in a “real” contemporary setting, where avid cultural tourists are visiting for the Venice Biennale, and then not only uses the city but also the Biennale venues for his locations. Aschenbach and the beautiful youth Tadzio wander through a labyrinth of contemporary art, but this does not alter their individual, parallel fates. At the climax of Ming Wong’s version, the beautiful youth still turns toward heaven and raises his fatal finger to the sky. This scene appears twice, whereas in the original Death in Venice it only appears only once, fleetingly. With Ming Wong playing both roles, this inevitably becomes a kind of performance of split personality, and because of this split consciousness, the opposition between the exhaustion and beauty of life in Death in Venice suddenly disintegrates; now, the youth’s gesture toward heaven is no longer a fatal strike against the middle-aged composer, but rather its antithesis: a pose of reconciliation. Accordingly, through its death in film, art earns an everlasting life. And how does Ming Wong achieve a parasitic relationship with other people’s lives in his films? He plays all the roles. In Angst Essen / Eat Fear, he plays both the Moroccan immigrant worker Ali and the German laundress Emmi who in spite of their differences in age and ethnicity become lovers; at the same time, he also plays the people who oppose their relationship. In Lerne Deutsch mit Petra von Kant (2007), he plays the heart-broken German woman from Fassbinder’s The Bitter Tears of Petra von Kant (1972). In Devo Partire. Domani. / I must go. Tomorrow. (2010), he plays the guest, the father, the mother, the son, the daughter and the maid from Pier Paolo Pasolini’s Teorema (1968). Ming Wong also makes other people act. 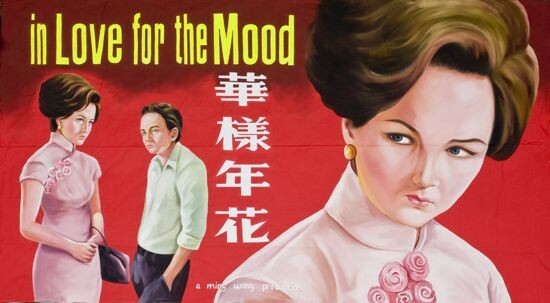 In In Love for the Mood, he has a Caucasian actress from New Zealand play the role of So Lai-zhen, portrayed by the Chinese actress Maggie Cheung in Wong Kar-wai’s original film. In Life of Imitation, he has a Chinese, a Malaysian and an Indian actor each take turns playing the roles of Sarah Jane and her mother from the original film. While these performances appear to imitate imagery from preexisting films, they are also a catalyst for the exercise of memory. They are a fresh rehearsal of images that formerly existed in the minds of the audience. Ming Wong’s genius of performance lies in his ability to capture not only form, but also the significance of the portrayal and re-portrayal of form. And so life is reborn through the deviations that appear in his particular re-rehearsal. Ming Wong plays all the roles: male, female, young, old, Malaysian, German, Moroccan; but what is interesting is that he has yet to play a Chinese person. The same person can be, without any contradiction: an American citizen, of Caribbean origin, with African ancestry, a Christian, a liberal, a woman, a vegetarian, a long-distance runner, a historian, a schoolteacher, a novelist, a feminist, a heterosexual, a believer in gay and lesbian rights, a theater lover, an environmental activist, a tennis fan, a jazz musician and someone who is deeply committed to the view that there are intelligent beings in outer space with whom it is extremely urgent to talk (preferably in English). Each of these collectivities, to all of which this person simultaneously belongs, gives her a particular identity. None of them can be taken to be the person’s only identity or singular membership category. I think this is related to the carnival of life. Is it not? An Asian person wearing a blonde wig to play the divinely beautiful youth Tadzio, while at the same time playing the composer Aschenbach who walks toward death – this in itself has an aspect of carnivalism, and tests the limits of individuality. What it suggests is that the space of images has the potential to stretch and expand the limits of individual life, and can in fact produce a collective life. Video still from Lerne Deutsch mit Petra Von Kant (2007). In Four Malay Stories, Ming Wong parrots Malaysian; in Lerne Deutsch mit Petra von Kant, he exerts himself in learning German; in Devo Partire. Domani, he studies Italian. He also makes other actors mimic foreign languages: in In Love for the Mood, he has a native English speaker mimic Cantonese speech. Using clearly flawed accents, Ming Wong reveals the awkwardness of imitation. Disinclined to the process of fully inhabiting the character, he instead finds his own voice from within the cracks of different language systems. In making his project Life of Imitation for the Singapore Pavilion at the 2009 Venice Biennale, Ming Wong rediscovered hand-painted movie billboards, as well as their gradual disappearance in Singapore. He tracked down the last remaining billboard painter in Singapore, Neo Chon Teck, and commissioned him to make posters for the pavilion. The disappearance of the hand-painted billboards also signifies the disappearance of a certain style of cinema in Singapore. The cinemas of Singapore’s golden age in the 1950s and ’60s have now been turned into shopping centers, housing complexes, churches and karaoke parlors. Ming Wong used Polaroid film to document these golden-age cinemas – their glorious pasts, fading presents and uncertain futures all become, in these instantaneous snapshots, specimens that the artist has rescued from time. Watching and being watched, and constantly watching again. In his film installations, Ming Wong imbues time and space with a new degree of uncertainty, in order to question and yet stimulate the ceaseless wavering of the spectator between the poles of desire and distance. For the installation of Life of Imitation, mirrors opposite two video monitors refract parallel and never-crossing worlds, and in In Love for the Mood, the triplicate images recurring across the installation’s staggered arrangement of three monitors reflect the multilayered variants and false-starts of passion. 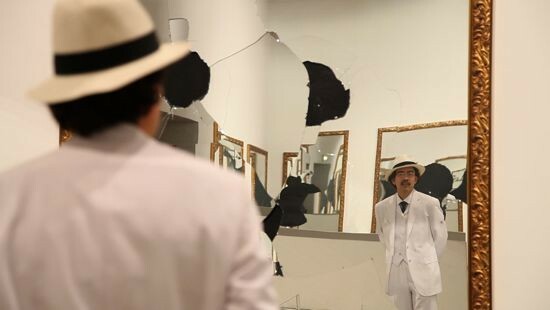 In Ming Wong’s film installations, reflections are not only illusions but also suggest and reproduce the depth of time, mirroring the slight transformations and variations of time. Thus images that originate from the “other” slowly merge with Ming Wong’s own life. Ming Wong’s filmic productions are always intertwined with the circumstances of his life at any particular moment, ingeniously reflecting his own personal experiences. His works are not only related to the reconstruction of the memory of filmic time, they are also, in a sense, his autobiographical restaging of the contemporary maturation process of an artist. It is just as the artist has said: “We are projected into an unidentifiable space and time where flashbacks and flash-forwards seem prone to occur.” What Ming Wong confronts is the brief super-imposition of his self and other people in the reflections of the world. Video still from Devo partire. Domani / I must go. Tomorrow (2010). In his remake of Pier Paolo Pasolini’s Teorema, what Ming Wong re-enacts are the instants when the family’s five members each lose their senses of identity. A Singaporean “stranger,” he directs and acts out the family members’ different life paths. In reinterpreting other people, do we recover our own identities? Or is it the opposite, in that it is only through losing our identities that we can recover them? Or, do we long for all of these possibilities to converge in one body, and bring us an endless current of vitality? Life, without a theorem. Sometimes even the slightest leverage can change your life completely. Can we not say that we are all strangers in life? Ming Wong‘s solo exhibition “Life of Imitation” is currently on view at the Singapore Art Museum through August 22. Wong is participating in the upcoming 8th Gwangju Biennale, “10,000 Lives,” at multiple venues in Gwangju from September 3 to November 7, and his solo exhibition, “Gruppenbild,” opens at the Neuer Berliner Kunstverein on September 28, continuing through November 5. Hu Fang is a fiction writer and co-founder of Vitamin Creative Space, Guangzhou, as well as the shop, Beijing. His latest book is the novel Garden of Mirrored Flowers (co-published by Sternberg Press and Vitamin Creative Space).